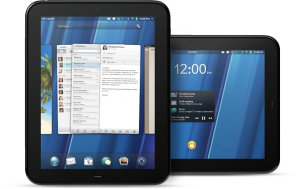 HP Touchpad is available now at Amazon and Co. Fellas over at Netbooknews made this nice unboxing video with a comparison to the Apple iPad2, Eee Pad Transformer and BlackBerry PlayBook. So if you’re curious to see how the HP Touchpad stacks up against the rest, check out the video below. See the WebOS 3.0 shine… But the hardware is a bit chunky and there is, as expected, a shortage on apps.